← Global Shipping, Global Trade & Economic Development — More Federal Money for Port Expansion? The Export – Import Bank was sued last year by various U.S. airlines (Boeing) to stop providing financing to foreign buyers of U.S. built airplanes. Some economists argue that such financing increases the competitiveness of foreign airlines at the expense of U.S. carriers. This is also the usual line from the Wall Street Journal editorial board. 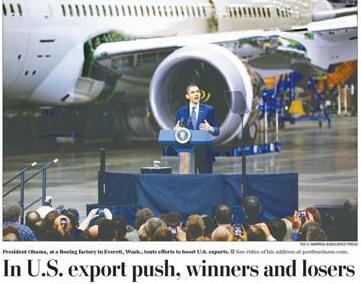 It argues that this U.S. policy amounts to an industrial policy of picking winners (U.S. plane manufacturers) and losers (U.S. airlines). That it’s some sort of corporate welfare at the expense of U.S. lenders of trade finance, which is financed by the U.S. taxpayer. This is not true. The real answer is that U.S. carriers should increase the quality of services if they really want to compete with service-oriented foreign carriers. U.S. government financing should not be curtailed because of specious arguments. It’s pragmatic and good public policy to provide this type of export financing to help U.S. manufacturers to remain competitive in the global market, especially since our competitors provide this assistance. In the long-run it is useful for trade diplomacy to try to reduce national financing of this type and this should be done through the WTO, OECD and bilateral negotiations. This entry was posted in Global Trade Relations and tagged competitiveness, Ex-Im Bank, export financing, foreign airlines, winners and losers. Bookmark the permalink.